Hey friends! I have a fun new recipe for you guys! This is my Individual Spinach Cheddar Egg Bake Recipe. And it’s quickly become one of my go-to breakfasts, even on busy work days. These egg bakes are designed for one person (you could easily multiply the recipe to serve more). Everything is more fun to eat in smaller sizes, right? 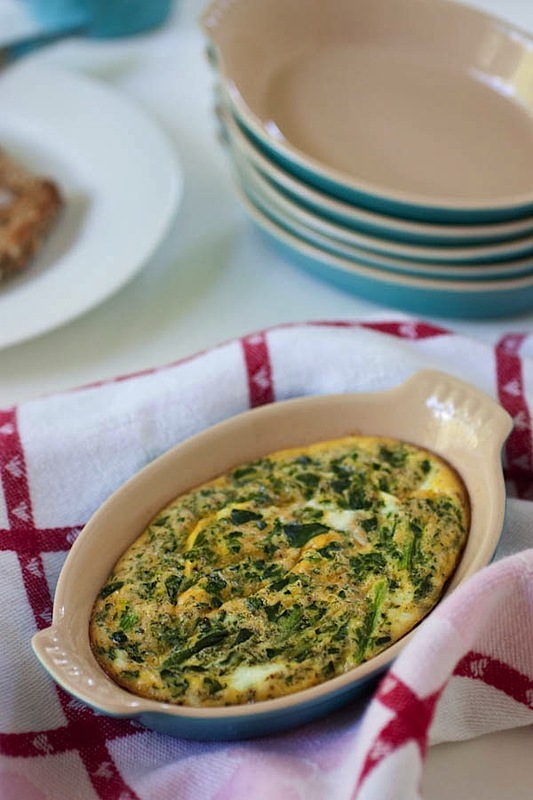 These easy egg bakes are the perfect busy morning breakfast. Who needs to spend all morning stirring scrambled eggs or flipping the pan-fried version? These egg bakes take less than 5 minutes to mix up and you can finish getting ready while they bake away. Switch out your favorite vegetables, cheeses, and herbs to tailor the flavor to your liking. Multiply the recipe to feed as many mouths as you need. dash of dill, optional, but fantastic! Pre-heat oven to 350 degrees F and lightly coat individual casserole dish(es) with butter (rub solid stick or brush with melted butter. Evenly distribute egg mixture to individual casserole dish(es). Bake until edges are golden brown and egg is set in the middle, about 16-19 minutes (depending oven temperature, etc.). Note: I used a toothpick to check doneness, sort of like you would for cake. Enjoy! Other veggies I recommend to mix in: chopped broccoli, kale, cauliflower. Yum! Additional flavor combos: broccoli/cheddar, spinach/feta, tomato/parmesan, sun-dried tomato + spinach/parmesan, kale/mozzarella, kale/smoked gouda…the possibilities are endless! 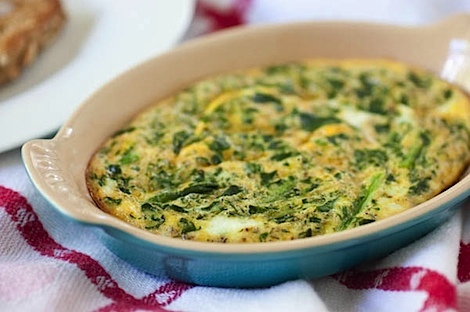 What veggie/cheese combo egg bake would you most like to eat? Looks so good! 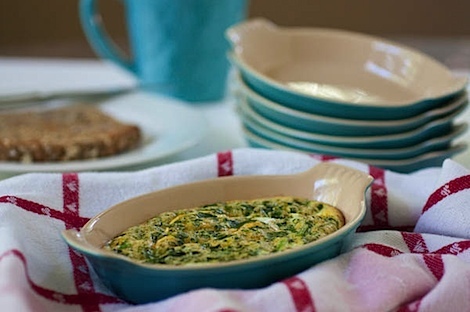 I love those little baking dishes, they look like the perfect size for individual foods and they’re so pretty! I am so happy that you posted this recipe, I have been wanting to try it since you first posted the pictures. I would have to put in Zucchini I am on a big kick for that at the moment. Where did you get the mini dishes? Yum! This is my type of dish! 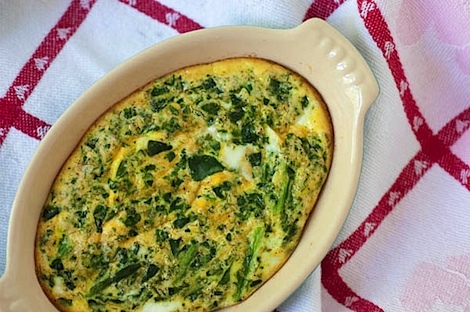 I love mushroom and goat cheese in my omelets so I’d try some in the egg bake :). I don’t like mushrooms…or goat cheese, but that actually sounds really good! I think that would make a nice flavor combo! They’re Le Creuset so you can get them anywhere that sells that brand – like Sur la Table. I’ve heard you can find them at TJ Maxx / Marshalls, too, for less. I think most places with kitchen stuff would have something similar – Target or Crate and Barrel. Do you have a temperature recommendation for cooking these? I’m not sure where to start….